Abseiling is a fun and enjoyable outdoor activity that people of all ages can participate in. Essentially, it involves you sliding down a rope under controlled conditions, under expert supervision from our qualified team. Abseiling can also be referred to as rappelling and is a technique adopted by people who rock climb, go ice climbing, canyoneering or mountaineering. Abseiling allows them to manoeuvre themselves down steep cliffs, for example. No doubt you will have seen TV outdoor expert Bear Grylls abseiling before, and this is the kind of thing you can try at Outdoor Adventure, but on a smaller scale (more info can be found here). Abseiling’s origins can be found as far back as circa 1870, when an alpine guide by the name of Jean Charlet-Straton would lead expeditions into the Alps from Chamonix, France. It has been claimed that Charlet-Straton attempted to summit Petite Aiguille du Dru on the Mont Blan Massif in 1876 and was unsuccessful, so was forced into finding a safe way down after becoming stuck on the mountain. This was when the abseiling method first adopted. Abseiling, as with any specialised outdoor sport, needs specific equipment so that people can enjoy it safely and securely. So what do you need? First of all, there’s the rope, this will keep you in contact with the surface you are abseiling down. Then there’s the harness. This will fit around you and is attached to the rope so that if you slip or let go of the rope you don’t go anywhere or injure yourself. Two more essentials used in abseiling are helmets and gloves, as you’d expect, these pieces of equipment protect your head and hands. There are several techniques on offer when it comes to abseiling. 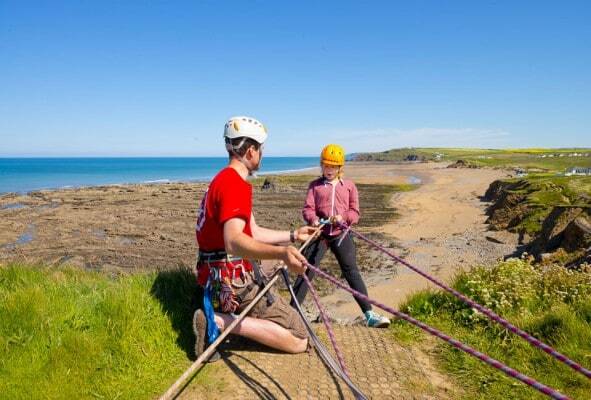 The standard method involves lowering yourself down a rock face, feet first, while facing the wall – this is what you will be doing with us here on your outdoor activity centres residential. Other techniques that can be used by more experienced abseilers include going face first down the rope or facing away from the wall too. As with all activities of this nature, there is an element of risk and because of this, it is essential that anyone attempting the activity who isn’t already trained or experienced should only go abseiling with qualified and trained staff or professionals. Training and supervision is included in our programmes and this will allow you to learn the correct technique and make you aware of how all the equipment works. Abseiling is a very popular activity with numbers increasing all the time and we’re sure that after you’ve given it a go with our friendly team here at Outdoor Adventure you’ll be hooked too!